Yesterday, a little before 2:00 in the afternoon, I went into the kitchen to fix myself a late lunch. I was working from home, as school is closed for Passover. 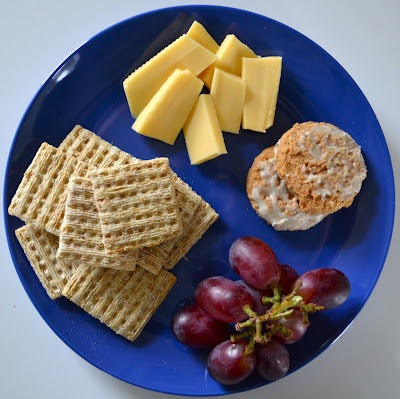 For some reason, the act of turning on the stove presented as extremely arduous, so the grilled cheese I had in mind was replaced by a mug of tea and this simple snack plate: a few slices of Gouda cheese, a handful of generic brand crackers, a small bunch of purple grapes, and two iced lemon oatmeal cookies. Before consuming, I paused to look at the food (a habit I'm trying to adopt in order to fully appreciate what fuels my body) and felt inspired to grab my camera. I sat cross-legged on the floor of the living room and ate every last crumb while watching a plump little bird hop along the window ledge to avoid getting wet from the waterfall in the gutter. I swear, it was the most fulfilling meal I've eaten in a long time. reminds me of the moment in "eat, pray, love" when she eats on the floor and savors every moment, every bite...love it! It really is a wonderfully balanced afternoon snack. Sometimes, the simplest foods are the most delicious. these are my favorite sorts of meals. the simpler the better! it's mostly due to laziness that i never ever cook, but i also feel really good about the fact that eating this way means eating mostly raw food, and that makes my body happy. Totally agree! Food is just food until you turn in into some form of art/pleasure/laughter. When my boyfriend makes me breakfast on weekends, he kicks me out of the kitchen and always surprises me with something, like an omelet's smiley face, or a side dish of my Mediterranean goodies, or a funny piece of sliced fruit. It's this what makes regular food wonderful. Love it! Beats any fancy restaurant's dish. I might have this tomorrow it looks so good! I love your sweet blog. So light and refreshing, inspiring and creative.